In 1968, Mario Bava collaborated with producer Dino De Laurentis (‘Serpico,’ ‘Red Dragon,’ 1976’s ‘King Kong,’) to bring to the screen one of the most popular Italian comic book heroes. Diabolik is not like many heroes of popular lore. Diabolik is a thief. He does not rob to the rich and give to the poor, but he is portrayed in the books (and it is alluded to in the film) that he is a sort of cult hero to the downtrodden masses. He carries no gun, his weapon of choice are throwing knives. His partner in crime is Eva Kant, who helps him carry out his crimes. His costume is skin-tight and black, with his head covered, leaving only his incredibly expressive eyes exposed. The character was created in 1962 by two sisters, Angela and Luciana Giussani. Tales of his exploits have been sold ever since. The movie opens with a decoy armored truck being loaded with bags of what appears to be money. However, it is in fact, blank paper cut in the shape of dollar bills. A second vehicle, designed to look like a wealthy aristocrat and his servant out for an afternoon drive is dispatched carrying the actual currency. Why the deceit? The government, (presumably the Italian government, yet the currency is US dollars,) is trying to thwart the thief Diabolik. Inspector Ginko thinks he has Diabolik beat at his own game. However, Ginko quickly learns that he can not out-think Diabolik and Ginko is quickly relieved of his cash. Diabolik then proceeds to steal a emerald necklace belonging to an English Duke and his wife who are visiting. He makes a daring escape, but Eva is injured while helping him. Valmont, a mobster played by Adolfo Celi, (best known as Largo in the James Bond movie ‘Thunderball,’) tries to apprehend Diabolik by kidnapping Eva and holding her ransom. He is quickly thwarted. As portrayed in the film, Eva is much more a damsel in distress than she is in the books, where she is portrayed as a confidant and partner in crime. And finally, after destroying all the government tax offices in the country, the government, with only its gold reserve to its name, tries to move it as a large, multi-ton brick to try and prevent Diabolik from stealing it. However, that too is taken by the cunning thief. ‘Danger Diabolik’ is a lush and colorful film, with the rich hues of Technicolor achieving seemingly any scenario that Bava could concoct. Bava was able to bring the project in under budget, (while De Laurentis experienced the exact opposite at almost the same time with ‘Barbarella,’) through his mastery of models and matte painting. Diabolik’s secret underground cave, (much like the Batcave, but larger and more elaborate,) is almost all matte work. Bava orchestrates the shots flawlessly. 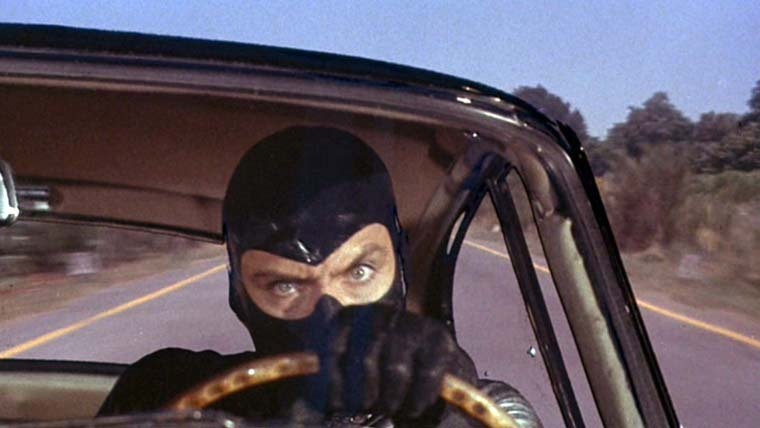 Even today, where high-quality video can betray the skilled work of the most impressive in-camera trickery, ‘Danger Diabolik’ still amazes. The look of the film, as well as it’s costume and set design have been borrowed or out-right stolen by other films for years. In one of the film’s most famous shots, Diabolik and Eva kiss in a large circular bed, while the money from their most recent heist floats down around them. Ok, I’m totally curious about this now. And knowing that the score was done by Ennio Morricone only makes me want to see it more.